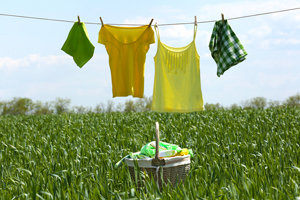 REAKNITT ZF is a modern crosslinking agent for the easy care finishing of cellulosic fibres. Textiles will become easier to iron and form less creases during wearing. Unlike many other crosslinking agents on the market, REAKNITT ZF is formaldehyde-free. Thus, a great variety of requirements on an ecological easy care finishing can be easily implemented. REAKNITT ZF has versatile application fields. The best effects can be achieved for outerwear as well as for home textiles. Moreover, REAKNITT ZF is excellently suited for the anti-pilling treatment of knitwear made of viscose. Easy care effects with maximum functionality are efficiently implemented with REAKNITT ZF and the perfectly adjusted catalyst CHT-KATALYSATOR ABT. In combination with specifically selected softeners and handle additives totally different requirements can be individually adjusted. The most important softeners are ARRISTAN 71 or TUBINGAL FMH, the most important additives are POLYAVIN PEN or ARRISTAN EPD. Just contact us and we will write a tailor-made recipe for you!